FAQs about our ad quality partner! PubNation runs underneath the hood with the majority of Mediavine ads. Its function is to grab all the technical details of an ad call so that we can work with partners to improve ad quality across the sites of Mediavine publishers. 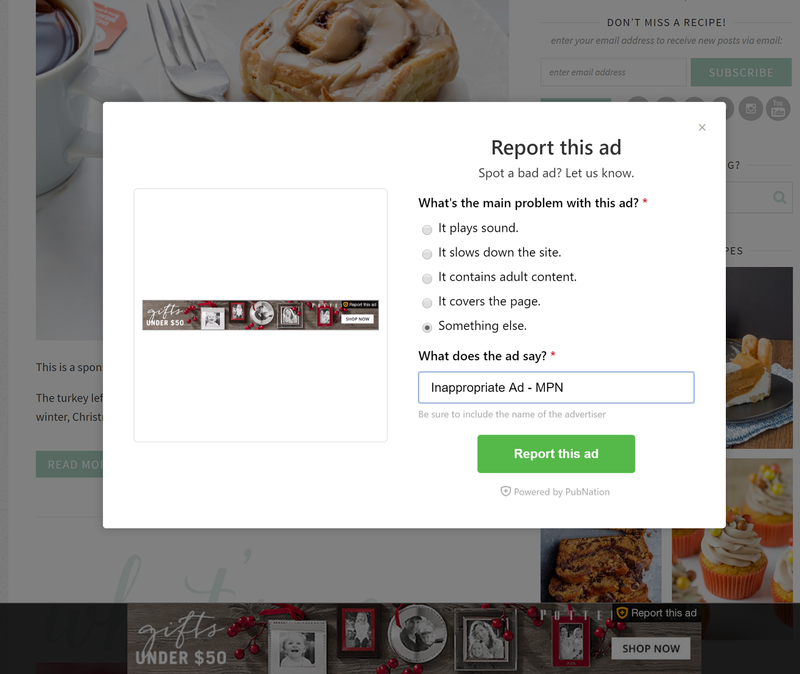 The little "Report this Ad" button underneath each Mediavine display ad, or behind the exclamation point on adhesion units is powered by PubNation. PubNation helps grab the more technical information of how an ad is served than a simple screenshot can provide. Mediavine works with up to 10 partners at a time, so finding a single ad from a partner is basically like searching for one needle in 10 different haystacks — unless you have the technical info behind the ad. That helps us narrow it down immediately, and work with the partner to remove the ad from the network, or your site, wherever possible. Do my readers or I need to install anything? To simply report an ad, no, you don't, which means the majority of your readers should be able to simply hit that Report button and then go about their day. But as a power user (i.e. site owner), you may be reporting more ads than most, because you're on your own site more than anyone else. Because of this, we highly suggest installing the PubNation extension for Chrome, if that is the browser you use. It's able to add an extra layer of tech stuff to the equation, making it even easier for us to track down a bad ad. Does reporting ads affect my status with the advertisers at all? NO. Absolutely not. The advertisers never see these reports, or who is reporting them. The reports go to a queue that belongs to Mediavine, and only Mediavine employees see them. Do I need to put anything special in my report? Yes! We'd prefer that you always add a reason for your report, such as "Inappropriate for my site" and "MPN". We can search the queue by text, so we work reports that contain "MPN" first. It is not. We have to work with each partner to submit reports, and we can only work the queue a few times a day. If there is something urgent, please email publishers@mediavine.com, and let us know you've sent a report through PubNation.